In order to run his wildlife sanctuary and also take part in the various conservationist efforts, Richardson sourced for funding. Feeding and taking care of the big cats require a lot of resources which can really be financially straining. But, Richardson’s unique relationships with these large and magnificent predators has opened up many sources of funding in terms of commercial and wildlife filming. 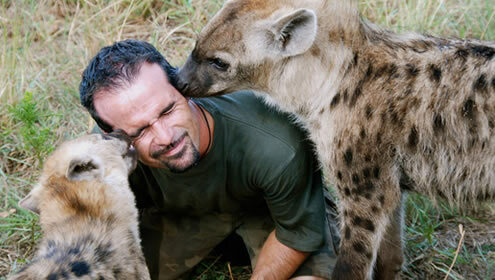 His astonishing abilities to do dangerous stunts alongside lions and other predators life hyenas and leopards gives his facility a forefront position in the wildlife filming industry. Also at the same time, the films has captivated the audience and imaginations of countless people around the world. 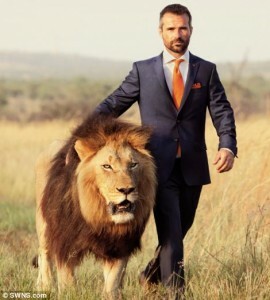 A poster showing Richardson walking beside a lion. Image source. Commercial filming crews are welcomed into his sanctuary to do filming of the predators. He has starred alongside his lions in countless documentaries that not only detail his controversial relationship with the carnivores but also highlight the plight of wildlife in Africa and around the world. Some of his documentaries like Growing up Hyena and In search of a Legend showcases the magnificence of the hyena clan and the black leopard and how due to habitat loss and human poaching, their existence itself could be threatened. It also serves to dispelling myths about these species of big cats. A shot from the documentary, “Growing up with Hyenas”. Image Source. 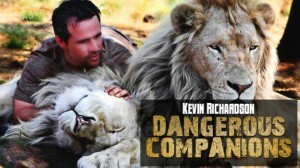 The other documentaries like Dangerous Companions and The Lion Ranger Series for National Geographic Wild provide insight into the world of the predators and features basically the difficulties that Richardson face in his conservationist efforts, daily struggles and dramas that the sanctuary and the animals face. The documentaries allow the audience to look closely into the relationships and bonds that Richardson share with these amazing predators. Using these documentaries, Richardson strives to urge people to act to save the predators’ populations in the wild and to stop the hunting and petting industries which have destroyed the wildlife. A poster for the documentary “Dangerous Companions”. Image Source. In 2013, a short documentary called “GoPro: Lions – The New Endangered Species?” was released featuring a team captures Richardson’s interactions with hand-reared lions and spotted hyenas through the use of GoPro cameras. The film illustrates Richardson’s unique relationship with the animals and attempts to create a platform of understanding their distinct personalities. Throughout the short film, Richardson continuously brings attention to the contemporary issues and consequences surrounding the loss of wildlife habitats in South Africa. A short clip taken with the GoPro cameras. Image source. Not only starring in the documentaries, Richardson has also produced an award-winning movie “White Lion” which features some of his lions. He also has starred in another movie call the African Safari 3D. Poster for the movie White Lion. Image source. One of the best-selling wildlife movies which has won many awards in the South African Film and Television awards. This dramatic feature film produced by The Lion Whisperer himself, is about a rare white lion’s adventurous journey in the wild. The movie increases people’s awareness against the Trophy Hunting Industry and provides a platform from which audiences around the world can actually experience the damages that humans have caused in the wild and how it has impacted the wildlife, especially the lion populations in Africa. 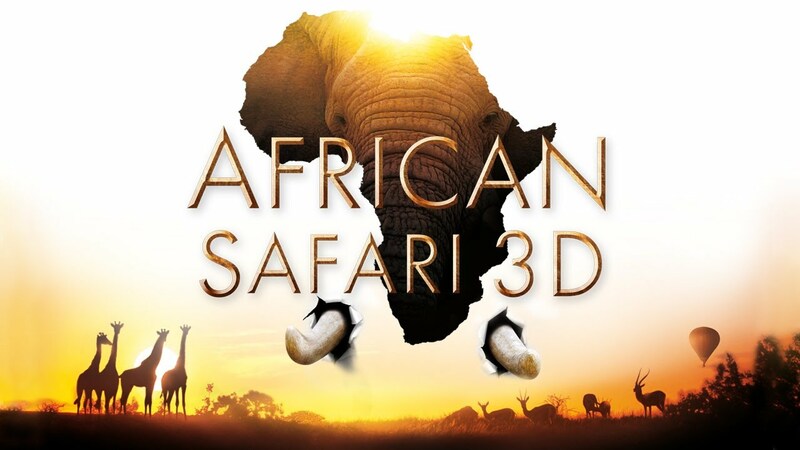 A poster of movie African Safari 3D. Image Source. Richardson even wrote a book called “Part of a Pride” and through it he tells the story of his life and work, how he grew from a young boy nicknamed “The Bird Man of Orange Grove” to a man who is able to communicate with the dangerous and feared predators of Africa. He discuss his unique method of getting to know their individual personalities and the reason behind the acceptance of him into their prides. 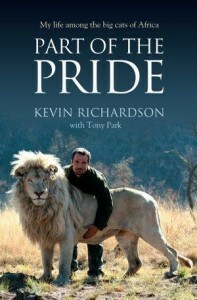 Richardson shares stories the animals themselves and his work on the feature film “White Lion”. One of his main points in the book talks about the state of lion farming and hunting in South Africa. Richardson, with the help of novelist Tony Park tries to show readers a different way of understanding the dangerous big cats of Africa and also raise awareness about the plight of wildlife. A picture of the book, Part of the Pride. Image Source. Using all the methods and sources of funding, Richardson till date has managed to sustain his own sanctuary and strive to bring about a change in South Africa. Richardson has also been featured prominently as a result of his ground breaking conservationist work on many local and international News Networks, Newspapers, including Sky News, CNN, ABC News, NBC, CBS, Carte Blanche and Top Billing. He even has a Youtube channel call “The Lion Whisperer TV”. Through all these media coverages on the plight of the animals, the stardom and fame he has earned has helped him reach out to people all around the world for their help. It was only with help of the donations from the audience and those who support his conservationist efforts that he was able to establish his own sanctuary. Thus, with the continuing coverage of the wildlife in Africa, Richardson hopes to bring about more radical changes to protect and preserve the wildlife while also gaining more funding for his resources.